Today we welcome a refugee from a dark and terrible place: the mid-90s. Iron Klaw has gone to extreme lengths to conceal his true identity. Unconfirmed reports state that he currently operates under the alias of Count von Rani, the deceptively benevolent leader of Kalistan, a small Eastern European nation. It is believed that he assassinated the Royal Family of Kalistan so he could replace them and assume sole power over their nation's resources. 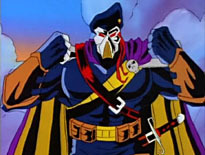 He has also taken a position as the leader of the military force known as S.K.A.R. (Soldiers of Khaos, Anarchy, and Ruin). Much like Genghis Khan, he abuses an extraordinary amount of power to enhance his personal empire without effective restraint. He rules by fear and anyone who opposes him is dealt with at the end of his bladed weapons. Iron Klaw is a strategic mastermind and completely power hungry. He secretly plots military operations while investing large amounts of capital into acquiring new weapon systems and technology for his growing army. It is not yet known if he is an ally or adversary of the Cobra organization. Because his ultimate motives are unclear, and may be based simply on the destruction of existing world powers for its own sake, it is imperative that GI Joe intelligence investigate, infiltrate, and dismantle his operation before it can spread to any other nations. 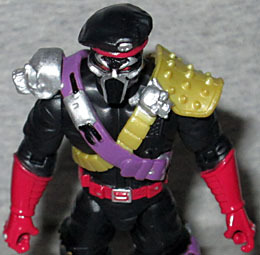 This is an awesome inclusion in the Figure Subscription Service, for several reasons: first of all, it's taking the main villain and his organization from GI Joe Extreme, in much the same way that Specialist Trakker brought in M.A.S.K. - not that there was ever a hard division between ARAH and Extreme (nor is this the first time they've been linked), but it's official now. The events referenced in the first paragraph of his filecard took place in the short-lived Dark Horse Comics run (though Genghis Khan wasn't really as much of a monster as the filecard would suggest, but everybody makes that mistake). Secondly, this figure was originally intended for release prior to the movie toys; it's just that no one knew about it until a Resolute comic showed up, revealing the plan to pair a Generation 3 Iron Klaw with a new Crimson Guard figure. In that continuity, "Iron Klaw" would have been an entire rank of elite Cobra troopers, not just one character - Siegies looking for a promotion could hope to move up to the Iron Klaws. Iron Klaw gets some great accessories. First there's his beret, which really could have been molded as part of the head but is instead separate. 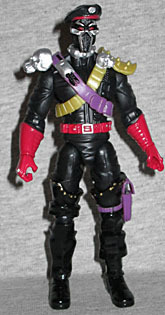 And since he has Destro's leg, he also gets Destro's small revolver. But then we get into the cool stuff. Like the grey pistol with a big blade on the end! It originally came with the G2 Munitia, but is similar to a gun that came with the second version of Iron Klaw back in the day. 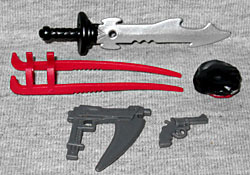 He's also got a hooked, red set of blades that clip onto his arm (like the armor on that same old figure). Finally, there's an update of the sword that came with the first Iron Klaw, and can be plugged onto the back of his purple strap. The only drawback is that the angle of his hand points his guns downward, but that's no bother. Despite the filecard saying it's unknown whether Iron Klaw is an ally or enemy of Cobra, there's a big Cobra logo right beneath his picture - kind of shatters the illusion. They could have easily put the SKAR logo in its place. Whatever's printed on the card though, Iron Klaw is a good addition to the ranks. He was good enough for the Alternators story, so he's good enough for ARAH, too.